Select desired dates and number of guests to see available accommodation options below. 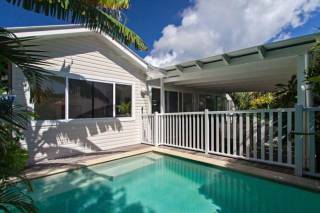 Step into Kia Ora Byron and you will immediately feel a sense of tranquility and relaxation. This is truly a beautiful house and the restoration has been completed with a wonderful attention to detail that retains much of the original character of the house while adding some fantastic improvements. 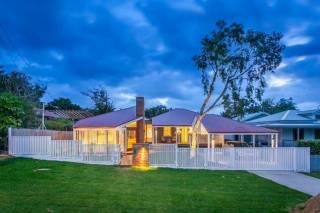 Located in central Kingsley St you can literally walk to town or the beach in less than 10 minutes. 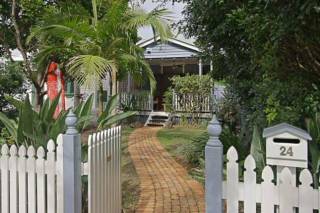 The property boasts three bedrooms and two bathrooms and is the perfect home for a family wanting a relaxed holiday in Byron Bay. The master bedroom offers a Queen size bed with ensuite. The second bedroom also contains a Queen and the third bedroom is a perfect kids retreat with a secret loft daybed, bed and TV & DVD. The house comes well equipped for a fully self catered family holiday. There is an extensive library, board games, DVD's and a fantastic modern kitchen allowing you to cook up a storm in style. There is a large flat screen TV for those nights in and also free Wireless Broadband should you need to connect. The kids and adults alike will relish the gorgeous pool surrounded by tropical gardens just off the expansive back deck area. There will be days where you will just not want to leave! Kia Ora Byron is a special house for a family who are looking for a stress free break without any hassle - enjoy. It is NOT a party house, we are located in a residential area so there are no exceptions to this. A $1000 Security Deposit is required prior to check in. Cancellations will result in a loss of your deposit OR full payment should this have occurred. We will endeavour to rebook your dates if at all possible. If we can rebook your dates for the same rate then we will refund you your deposit less a $100 cancellation fee and credit card fees if you paid by credit card. If we need to discount to rebook your dates then we will refund your deposit less the difference between the rates and a $100 cancellation fee and credit card fees if you paid by credit card. A $55 non refundable Booking Fee applies to all bookings. As a duty of care to our properties the management reserves the right to refuse any bookings that we feel may be inappropriate or fall across the Schoolies dates. If you're booking covers both Christmas Day and New Years Eve then the booking must be at least 12 days in length. Noise/Functions/parties - Excessive noise and functions are not permitted as they can cause disruption to neighbours. A security company may be called to investigate complaints of excessive noise or anti-social behaviour incurring up to $200 charge for call out, which is taken from the security deposit. After one warning guests may be evicted from the premises by security with loss of rent and bond. If an unauthorized function is held at the property then your whole bond will be retained.